The objectives of this study were to understand the mercury daily intake and hair-to-blood mercury ratio in fishermen and non-fishermen families in the coast of the Persian Gulf in Iran. The mean mercury concentration in the hair of fishermen and non-fishermen families was 5.76 and 2.27 μg/g, respectively. The mean mercury concentrations of RBCs were obtained for fishermen families and non-fishermen families: 35.96 and 17.18 μg/L, respectively. Hair mercury concentrations in 17% of people were higher than 10 μg/g, the No Observed Adverse Effects Level set by the World Health Organization. 78% of people had a blood mercury value > 5.8 μg/L, the standard level set by the U.S. Environmental Protection Agency. A significant correlation (r = 0.94, p = 0.000) was seen between log hair and RBCs mercury concentrations. The mean mercury daily intake for fishermen and non-fishermen families was 0.42 and 0.20 µg/kg BW per day, respectively. 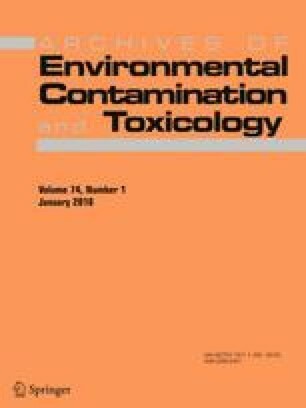 The mean mercury daily intake of fishermen families was higher than the provisional tolerable daily intake (0.23 µg/kg BW per day) suggested by the Joint Expert Committee on Food Additives. Mercury daily intake significantly correlated with fish consumption (r = 0.50, p = 0.000) and log hair mercury (r = 0.88, p = 0.000). The total mean of hair-to-blood mercury concentration ratio was 306. We conclude that the use of mercury concentrations in the hair and RBCs could have been suitable biomarkers for predicting mercury exposure of people with a high rate of fish consumption. This article is the part of the Ph.D. thesis of environmental pollution that is supported by Tarbiat Modares University. The authors thank the general directorate of fisheries Hormozgan and Bushehr provinces for help with the sampling collection process. They also appreciate the directorate of fisheries in Mahshahr for official cooperation. Informed consent was obtained from all individual participants included in the study. All subjects were informed that the data from the research protocol would be treated in an anonymous and collective way, with scientific methods and for scientific purposes in accordance with the principles of the Helsinki Declaration (World Medical Association 2008). This study was approved by the Ethical Committee of the Tarbiat Modares University (No. 1218312), as part of the Iranian observatory for mercury and health risk assessment.